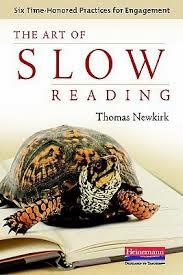 While I may agree with some of Newkirk’s points that you have listed, I disagree that education moves too fast. If he means it pushes students through too much content too quickly, then yes, I agree. But the education system does not move quickly enough. Too many policies are still being made for a bygone era. That’s not to say that individual teachers, principals and schools are not doing good things, but if they are it’s probably because of who they are and in spite of systemic policies. Thanks Norah for commenting. I think the point Newkirk was trying to make is that education cannot keep up with the advances with technology, and instead of just trying to keep up, educators might be wise to slow down and dig more deeply into the rich content right in front of us, digital or otherwise. It’s an issue with unpacking and debating. Thanks again Norah for sharing your thoughts. Norah, your question was a good one. My response was only to continue the conversation. I hope you will enjoy the book. Previous Previous post: Which case should I get for my iPad Air?